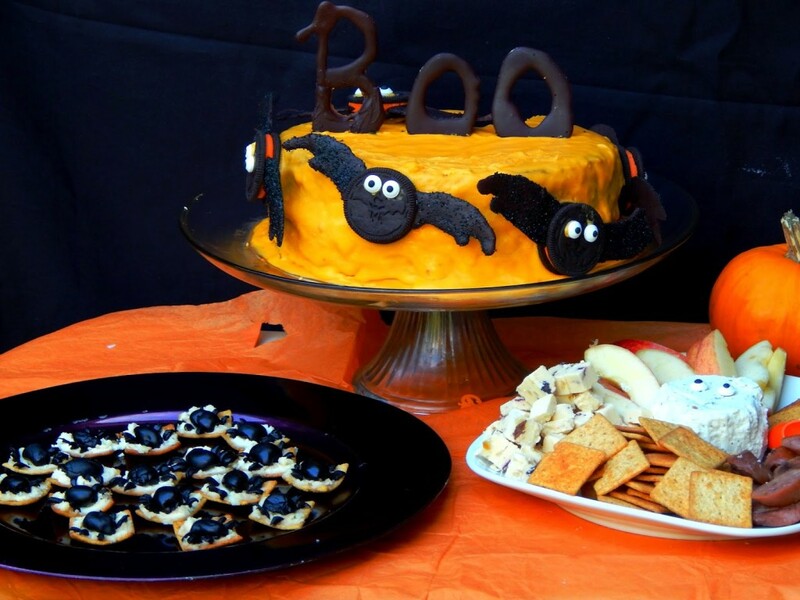 Home Desserts	Halloween Snacks Idea + A Chocolate Orange Cake Recipe! 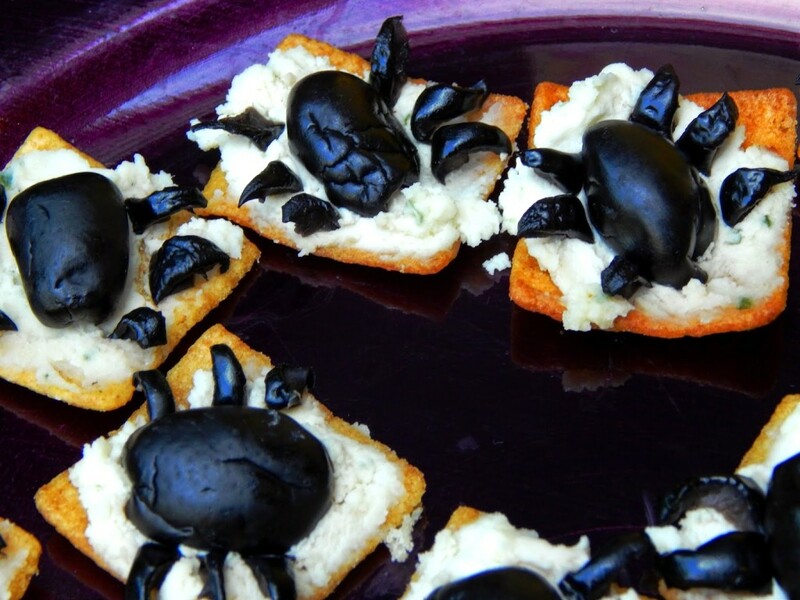 Slice olives in half lengthwise (one olive = one spider) Place one half of the olive on the cracker and then slice the other half lengthwise into strips, and then cut the strips in half. These will make the spider legs. 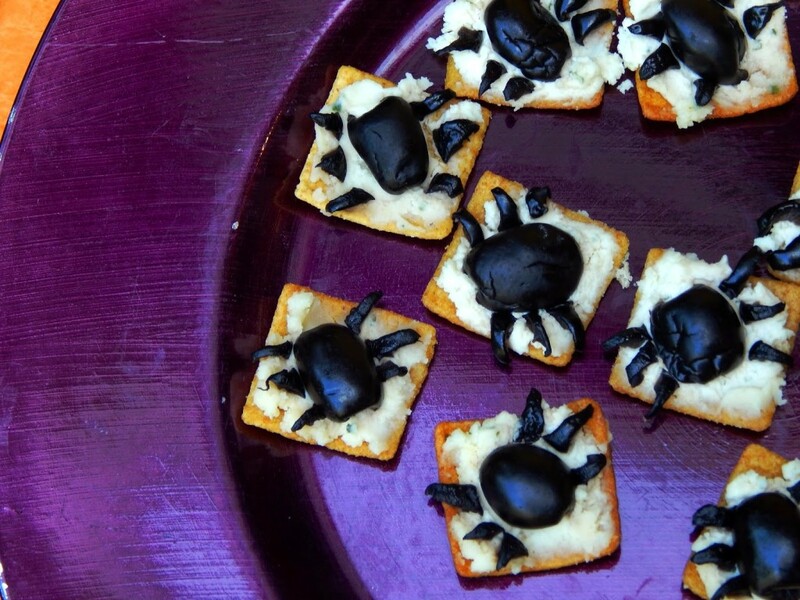 I ended up only putting 6 legs on my spiders because I think it fits better on the Wheat Thin, but you could put 8 on there if you want to. Voila! 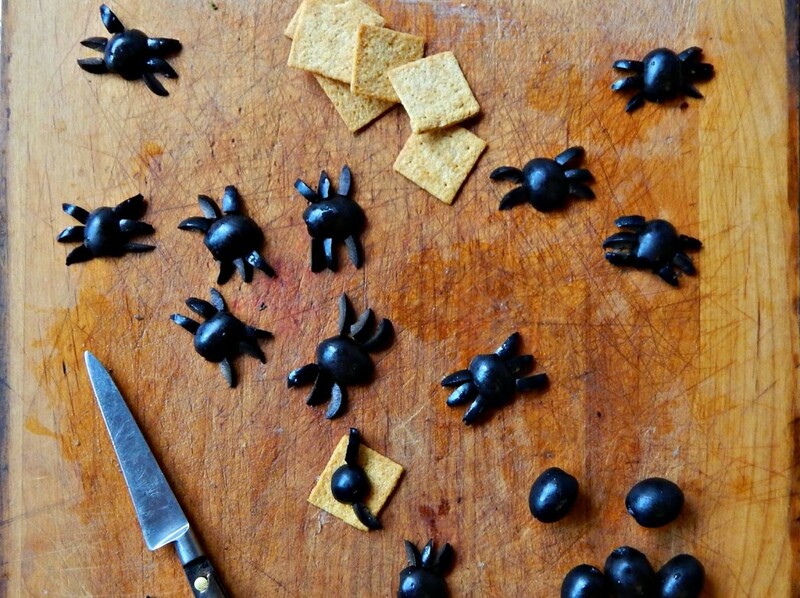 Easy spider snacks for Halloween. 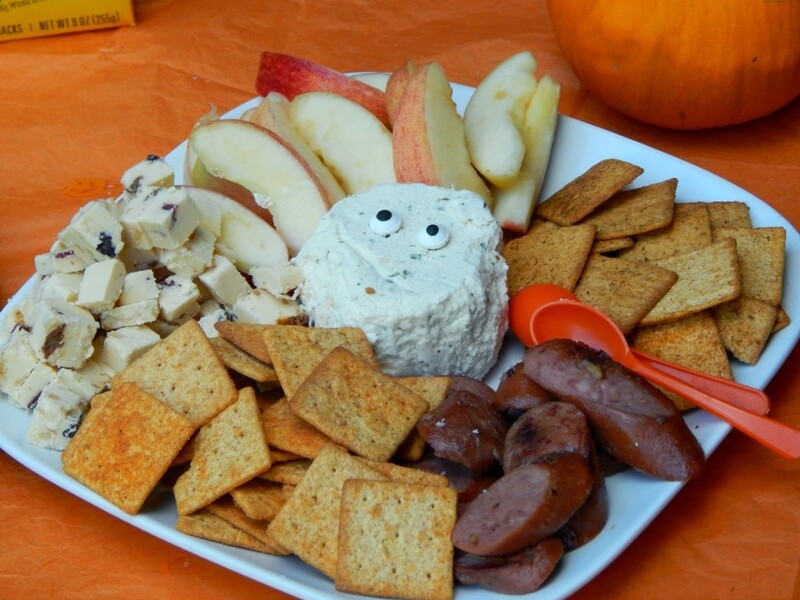 And if you’re pressed for time you can add edible eyes to almost anything to spook it up! 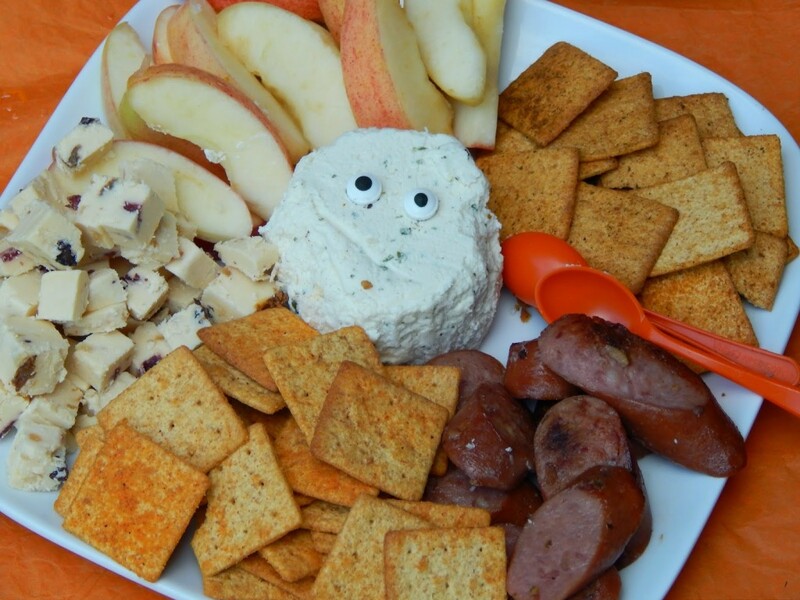 I also made a simple kid-friendly snack platter with Wheat Thins, spreadable cheese, smoked sausage, and sliced apples. 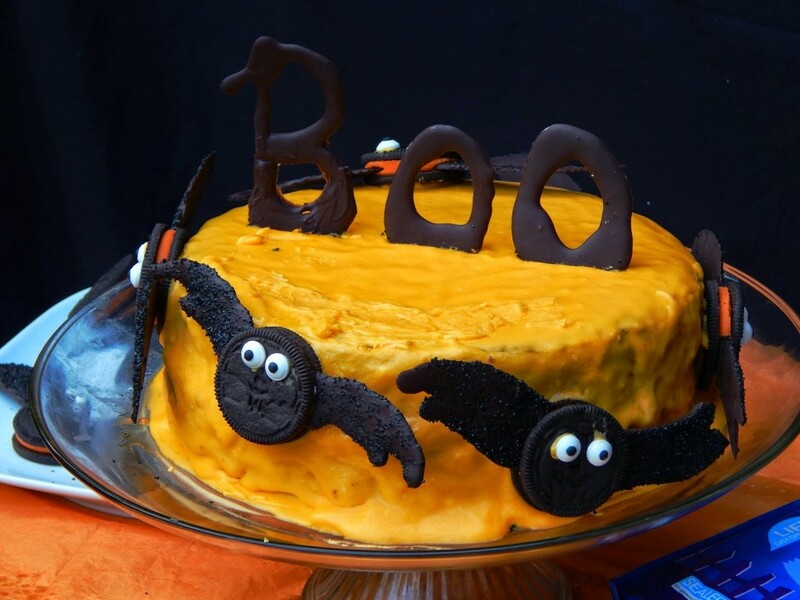 Next up I made a homemade cake…do you know how long it’s been since I made one from scratch?? It seems like I only take the time to do it when there’s a holiday, and then the cake is gone in like a day! 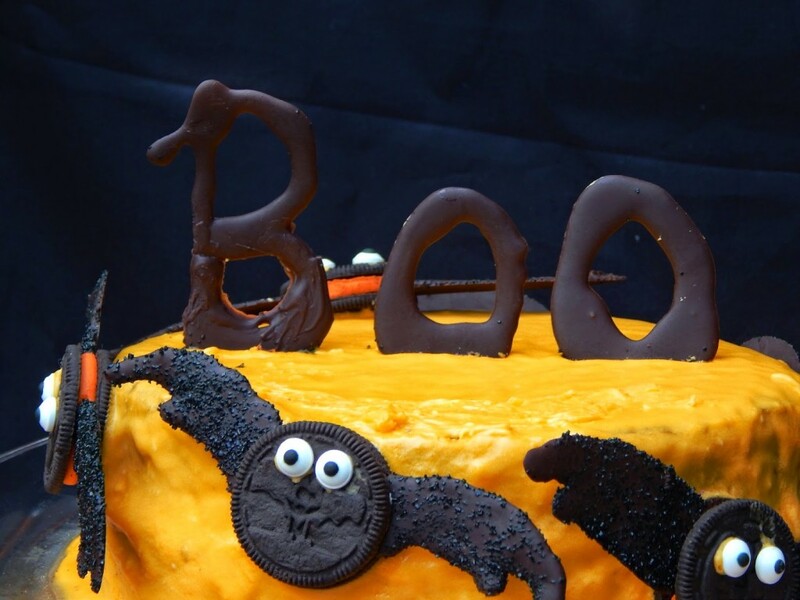 I made a chocolate cake with orange frosting and decorated it with a chocolate “Boo” sign and Oreo bats. The recipe is one that I modified slightly from one of my cook books (Chocolate Birthday Cake; Celebrate by Sheila Lukins) only because I didn’t have the exact ingredients – and it still turns out amazing! Melt the chocolate over a double broiler and set aside. In a large bowl cream the butter and brown sugar using a mixer. Add the eggs one at a time, and then slowly mix in the melted chocolate. In a separate bowl mix the flour, baking soda, and salt. Begin pouring flour mixture into the chocolate mixture, and then alternate with almond milk until everything is mixed well. Mix well, and then add boiling water and vanilla slowly until mixed completely. Pour batter into greased and floured cake pans, and then bake at 375 degrees for 45-50 minutes. Mix butter and powdered sugar together, then slowly add milk and flavoring until combined. 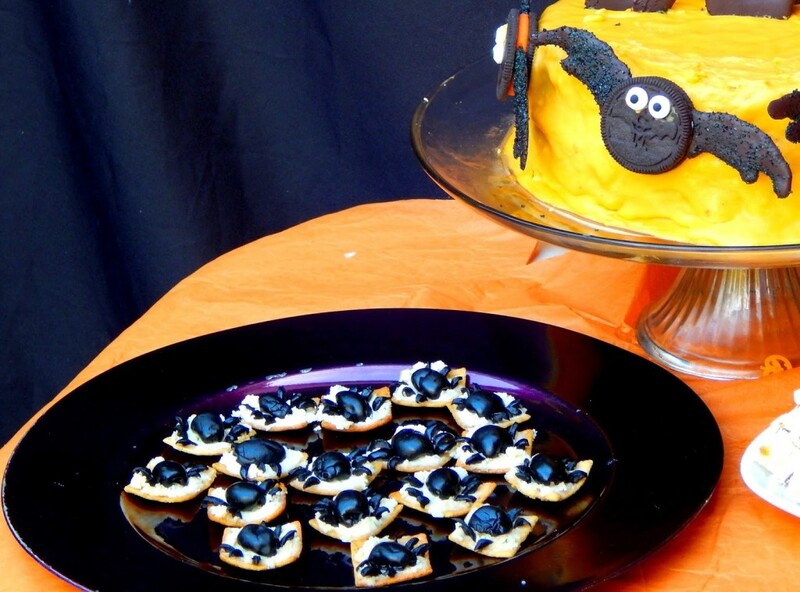 Oreos – use the Halloween orange ones to make them extra festive! Melt the chocolate over a double broiler and then pour into a disposable pastry bag. 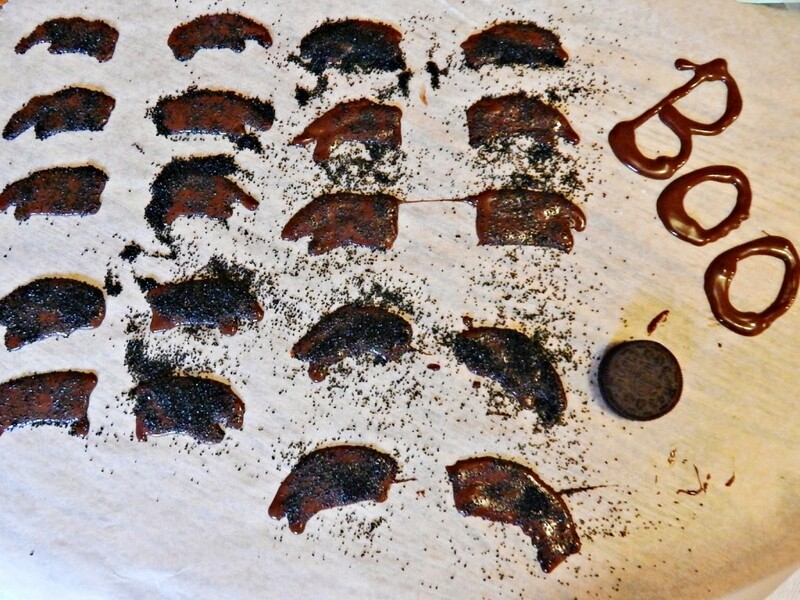 Pipe bat-shaped wings onto parchment paper and then cover with black sprinkles. Set aside until dry. Carefully insert a wing into each side of the Oreos. 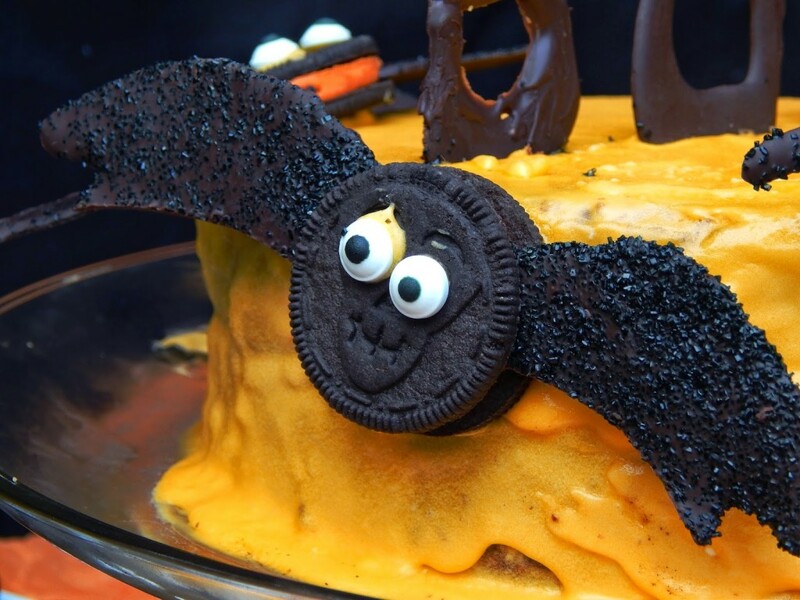 Using frosting, attach eyes to the Oreos. You can also pipe letters out to later add to the cake. After the cake is baked and cooled, cover in orange frosting and then set inside the refrigerator to let the frosting set. Before serving attach the bats on with a little frosting, and carefully press letters into the cake. Whew! And there you have it! 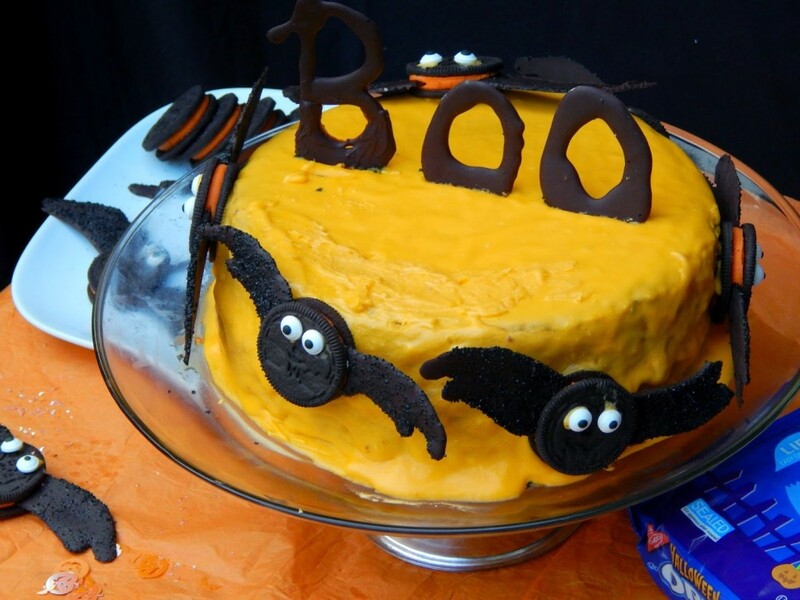 My version of a Chocolate Orange Bat Cake! 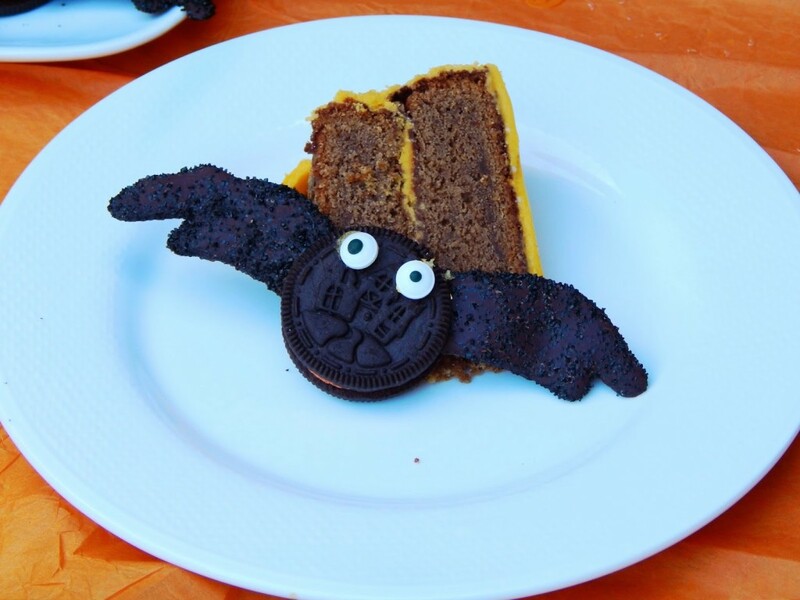 The Oreo bats are of course just as fun to eat on their own too. 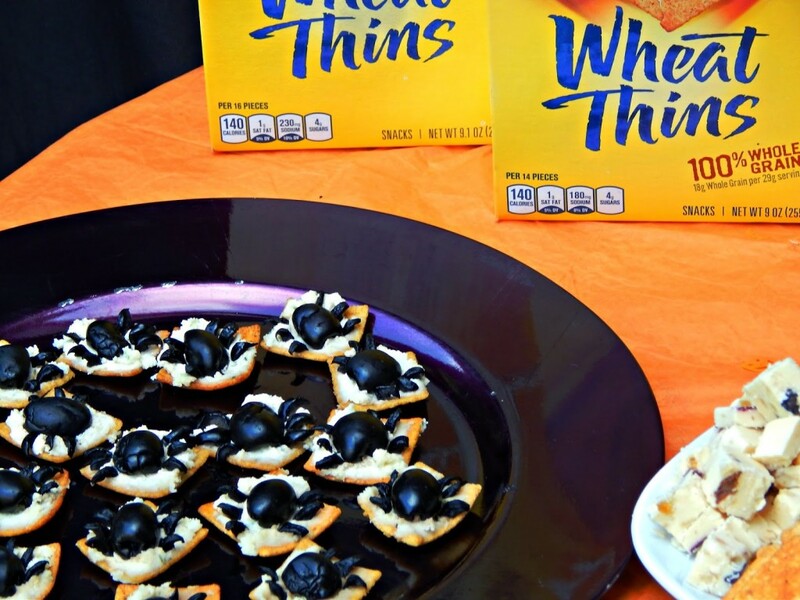 You can find all of the supplies, including the Halloween Oreos at Walmart in the snack aisle! 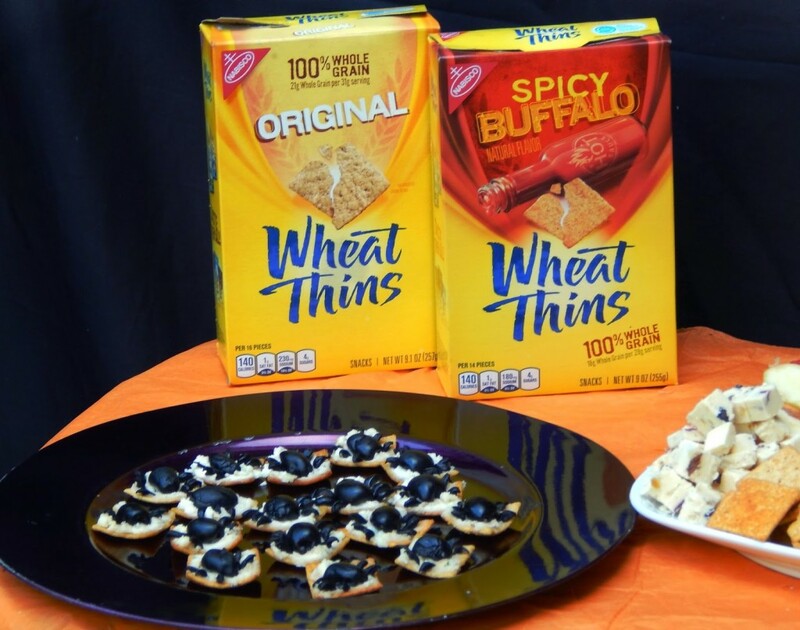 What Halloween #SpookySnacks are you making this year? Those bats are SO cute!! What great ideas! 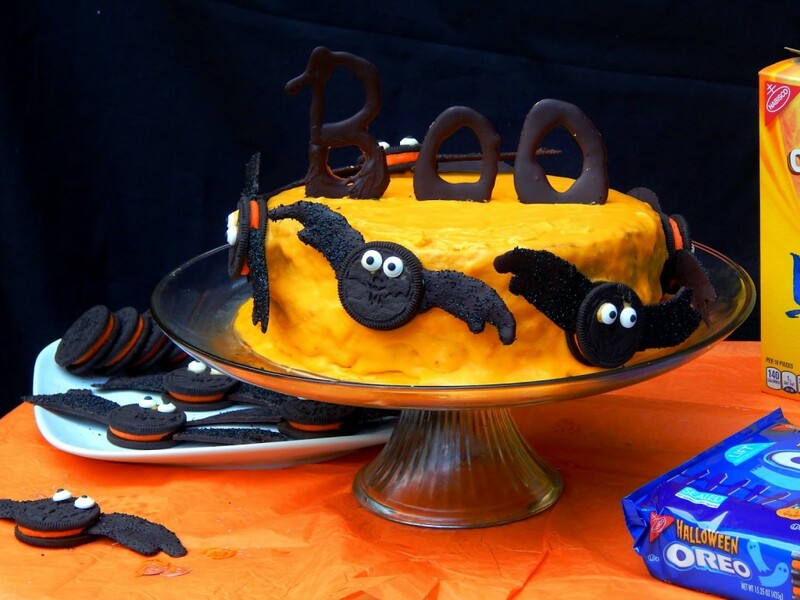 The cake and bats look tasty and fun! 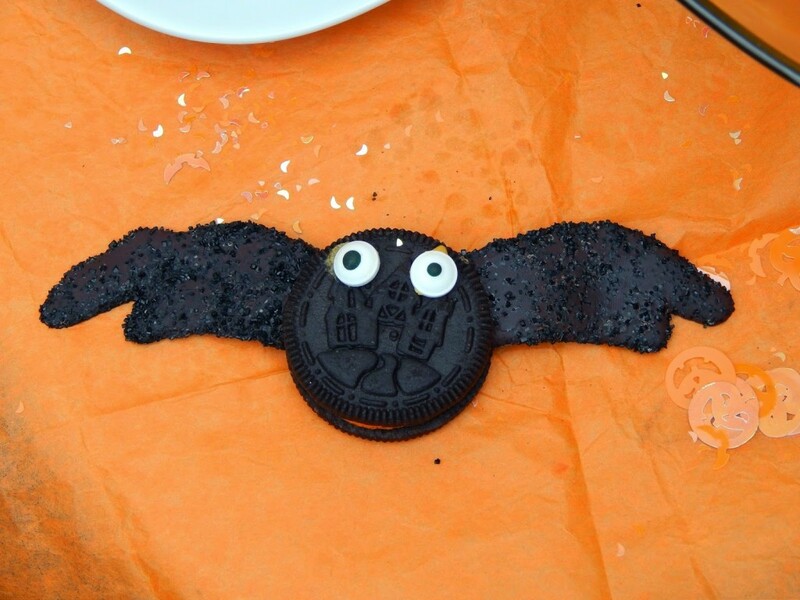 …I really want a Halloween Oreo now lol. 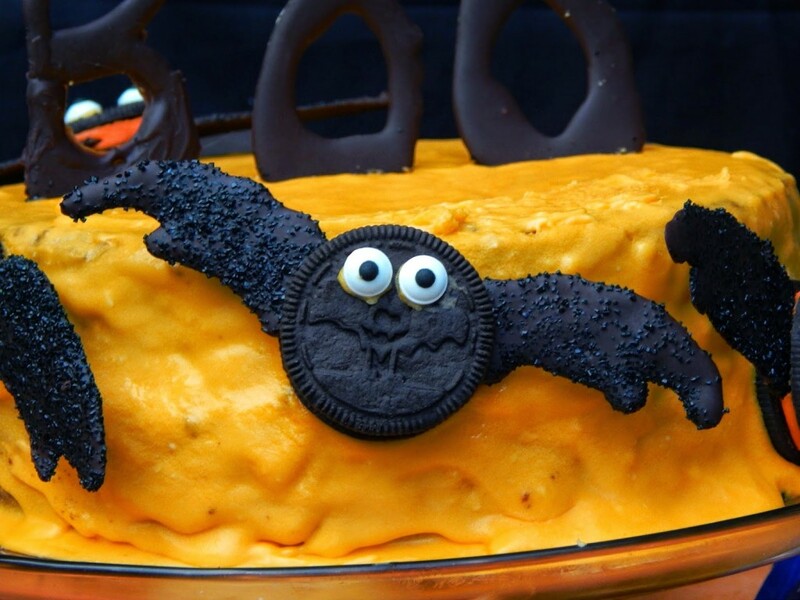 oh my goodness, this cake is so darling! 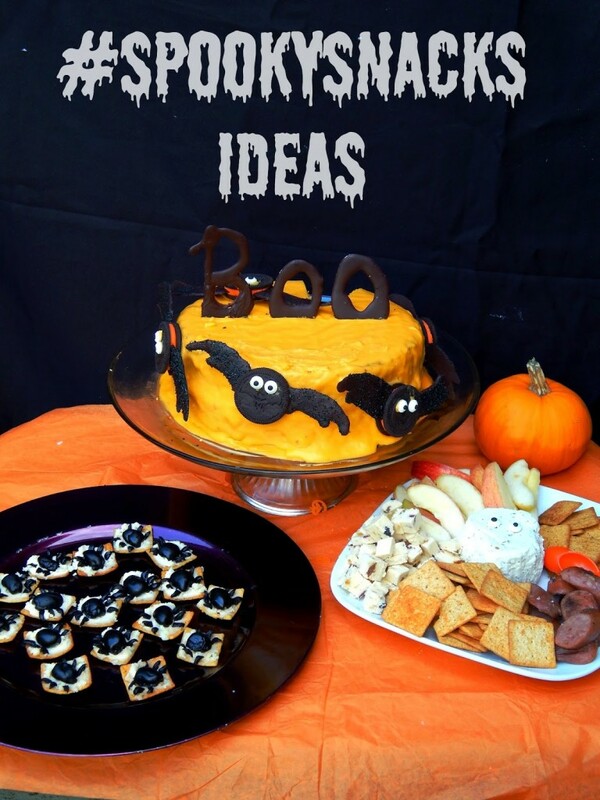 love the other treats too!